Airtel unlimited time packs that are ditching out unlimited browsing data downloading data for its subscribers is back! With the affordable night and weekend plans relaunched a few days ago, Airtel is bent on clinching the title from Globacom for been the network with cheapest data plans. The good thing about this Airtel time-based plan is that it allows you to download any size of file like 1 GB and 20 GB etc. for a specified period of time within the range of 30 minutes or 3 hours while still engaged a ton doing so even in trying times such as this. 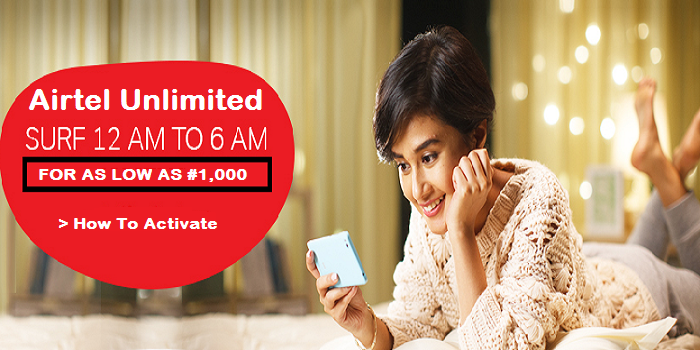 The Airtel unlimited time packs are very fast on internet browsing and downloading your favorite movies, series, music, and lots of stuff online. And if you don’t like the daytime plans because they’re too short or expensive, the Airtel unlimited night time pack has got you covered. First, you should know that the plans listed here are not “cheats”. No matter the bundle you opt in for, these plans give you unlimited access to the internet for the time you purchase, no speed throttling, no data caps. To subscribe to the daily time packs, dial *439# and follow the prompt to get you started. It should be noted that once you subscribe for a day either 1hour or 30 minutes you can’t subscribe that same one again till the next day, just like a daily subscription but is unlimited time based. And if network connectivity is super strong in your area, like really strong, then you should definitely take a look at the next heading. This plan is only usable between 12 am and 6 am – the time normal humans use for sleeping. Fortunately/Unfortunately, I am not normal. The time normal folks are crashing is the time Internet scavengers (like me) get the bulk of our work done online – I am typing this post at 2:49 am. This plan will not be available forever (it was previously priced at ₦200), so make the most of it while it lasts. Meanwhile, let us know your thoughts about Airtel unlimited time packs for unlimited browsing and downloading using the comment box below.